Tramadol is a synthetic opioid agonist that acts centrally, which is used in a similar way to codeine, to treat moderate to moderately severe pain in adults. Tramadol is frequently used in medical practice to relieve pain, but many people get it without prescription for recreational purposes, since it produces a sensation of pleasure similar to that of opiates. This can easily lead to the addiction of the drug. What happens if I skip a dosage? What would happen with an overdose? Tramadol addiction is a serious medical and social problem. Tramadol is available in the form of tablets. It is one of the most widespread, addictive and easily available drugs today. Although it is true that Tramadol is sold under medical prescription, it can be easily purchased online, which facilitates access for many drug addicts. For medical purposes, Tramadol is used to manage various forms of postoperative pain, arthritis pain, pain from myofibralgia injuries and many more. Tramadol is a very effective analgesic, but like any other narcotic drug, Tramadol presents a great risk of addiction , especially if the drug is taken in larger amounts and for a long time. Because it has all the properties of opioids. The regular use of Tramadol creates typical physical and psychological dependence. Addiction to Tramadol is common. Due to the risk of overdose, the daily dose of Tramadol should not exceed 400 mg. At higher doses, Tramadol reduces respiratory function, making breathing dangerously slow and shallow. Additional precautionary measures should be taken if Tramadol is used with other types of medication. There have been numerous cases of seizures, when Tramadol is used in combination with other medications, as well as deaths due to overdose of Tramadol. Because it is a strong pain reliever, Tramadol causes “lows.” It is known to slow cognitive processes and impair judgment and motor reactions. Doctors discourage the use of Tramadol by people who operate heavy equipment or perform tasks that require alertness. INCORRECT USE OF THIS MEDICINE MAY CAUSE ADDICTION, OVERDOSE OR DEATH. Keep the medicine in a place where others can not find it. Tramadol should not be administered to a child under 12 years of age. Ultram ER should not be administered to a child under 18 years of age. Taking tramadol during pregnancy can cause withdrawal symptoms that can put the life of the newborn baby in danger. Fatal side effects can occur if you use tramadol with alcohol, or with other drugs that cause drowsiness or slow breathing. if you have used MAO inhibitor in the last 14 days an MAO inhibitor (such as isocarboxazid, linezolid, methylene blue injection, phenelzine, rasagiline, selegiline, or tranylcypromine). Do not give tramadol to anyone under 18 who has recently had surgery to remove the tonsils or adenoids. mental illness, or attempted suicide. If you use tramadol during your pregnancy, your baby may become dependent on the medicine. This can cause withdrawal symptoms that can put the baby’s life at risk after birth. Babies born with dependence on a habit-forming medication may need medical treatment for several weeks. Do not breastfeed your baby. Tramadol can pass into breast milk and may cause drowsiness, trouble breathing, or death to a nursing baby. Follow the instructions on the prescription label and read all the medication guidelines. Never use tramadol in larger amounts, or for longer than prescribed. Tell your doctor if you feel an increased desire to take more of this medicine. Never share this medicine with another person, especially someone with a history of drug abuse or addiction. INCORRECT USE CAN CAUSE ADDICTION, OVERDOSE OR DEATH. Keep the medicine in a place where others can not find it. Selling or giving away tramadol is illegal. Stop taking all other narcotic pain medications you take during the day when you start taking tramadol. Tramadol can be taken with or without food, but take it the same way every day. Swallow the capsule or whole tablet to avoid exposure to a potentially fatal dose. Do not crush, chew, break, open, or dissolve. Never crush or break a tramadol pill to inhale the powder or mix it in a liquid to inject the drug into a vein. Doing this has resulted in death. Do not stop using tramadol suddenly, or you could have unpleasant withdrawal symptoms. Ask your doctor how to stop taking tramadol safely. Store at room temperature away from moisture and heat. Keep a record of your medicine. You should know if someone is using it inappropriately or without a prescription. Do not keep opioid medications that are too large. Only one dose could cause death to someone who uses the medicine by accident or incorrectly. Ask your pharmacist where to locate a drug collection program. If there is no collection program, flush the medicine that you are not going to use in the toilet. Since tramadol is used for pain, it is unlikely that you will forget a dose. Skip any dose you stopped taking if it is almost time for the next dose. Do not use two doses at a time. An overdose of tramadol can be fatal, especially in a child or in another person who uses the medicine without a prescription. Symptoms of overdose may include slow heartbeat, severe drowsiness, cold and clammy skin, very slow breathing, or coma. Seek emergency medical attention if you have signs of an allergic reaction (hives, difficult breathing, swelling of the face or throat) or a severe skin reaction (fever, sore throat, burning eyes, skin pain) , red or purple rash that spreads and causes blistering and peeling). This medicine may slow or stop your breathing, and may be habit-forming, and death may occur. A caregiver should seek emergency medical attention if you have slow breathing with long pauses between breaths, blue lips, or if it is difficult to wake him up. low levels of cortisol – nausea, vomiting, loss of appetite, dizziness, tiredness or weakness that get worse. Seek immediate medical attention if you have symptoms of serotonin syndrome, such as: agitation, hallucinations, fever, sweating, jerking, rapid heartbeat, muscle stiffness, spasm, loss of coordination, nausea, vomiting, or diarrhea. Serious side effects may occur more likely in older adults and those who are overweight, malnourished, or debilitated. Prolonged use of opioid medications can affect fertility (ability to have children) in men or women. It is not known if the opioid effects on fertility are permanent. 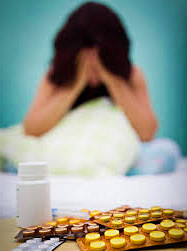 If someone misuses Tramadol for a long time and tries to quit the drug, they will experience both psychological and physical symptoms , including: depression, drastic mood swings, anxiety, nervousness, aggression, insomnia, nightmares, goose bumps, electric shock sensation, restlessness, muscle pain, stomach cramps, sneezing, sweating, palpitations, tremors, headache, nausea and diarrhea. Withdrawal symptoms are more evident when the use of tramadol is abruptly stopped. Treating addiction to Tramadol is not an easy process. The process of overcoming this type of addiction is similar to any other process in which the individual becomes physically dependent. There are two ways to detoxify from Tramadol . The first “gradually wean” the addict from the use of the drug, to avoid the symptoms of abstinence . The idea is to reduce the doses of Tramadol with extreme care, so that the body can get used to a smaller amount of drug, until it is completely suppressed. Depending on the initial dose of Tramadol, the entire detoxification process can last at least 2-3 months. If the gradual decrease in the drug does not produce the desired effects and you still feel the symptoms of withdrawal or is afraid to feel them, the best option for you is the Rapid Detoxification of Opioids. It is fast, efficient, safe and comfortable. Complete cleansing of the organism requires 3-4 days of treatment in the hospital.